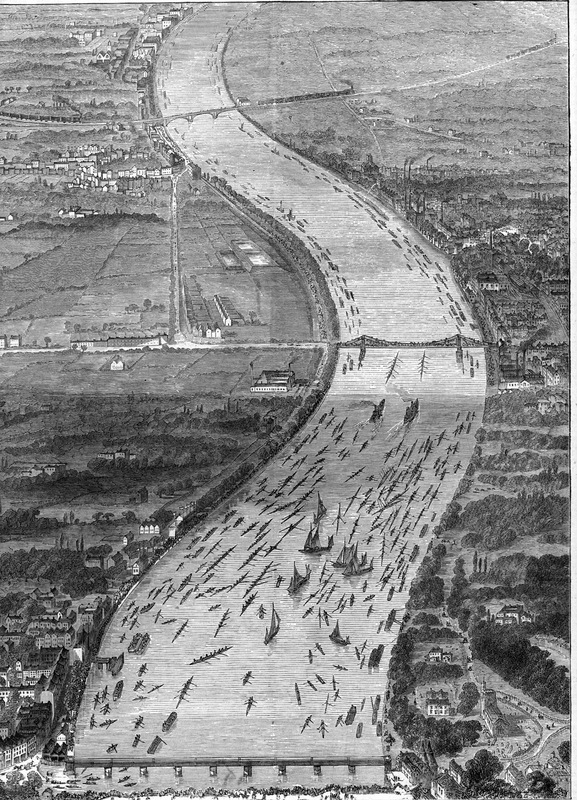 The river is one of the few things in the Boat Race that has not altered much since this engraving was made in 1870. 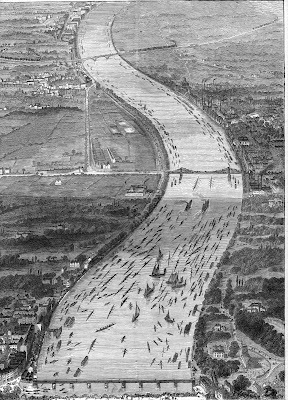 Like most things that appear unchanging, the Boat Race is always evolving. If you are interested in rowing enough to be reading HTBS then you will almost certainly know the result of the 159th Oxford - Cambridge Boat Race and you will have probably watched it live on television. If you somehow missed it, Oxford won by 1 1/3 lengths in a time of 17 minutes 28 seconds. 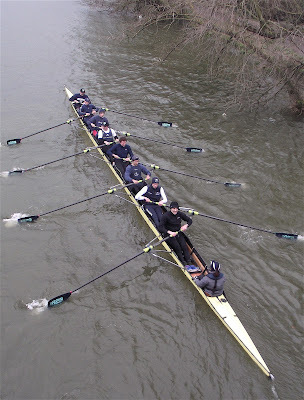 This completes a ‘clean sweep’ for the Dark Blues who, half an hour earlier, won the heavyweight reserves race (Isis - Goldie) and who, last week at the ‘Henley Boat Races’, won all four events. 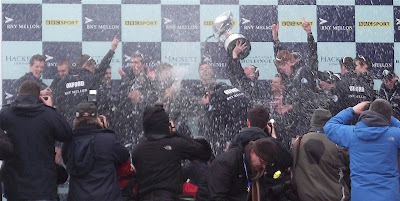 Boat Race Day 2013 was a great success with reasonable weather and two exciting races that were fought through to the finish – without interference from ‘outside agencies’. I cannot add to the numerous commentaries of those who are far more expert than I am. 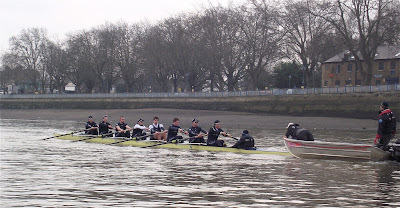 Instead, I am simply posting some images of Boat Race Day as I saw it (with a little bit of history thrown in). I hope you enjoy the pictures. 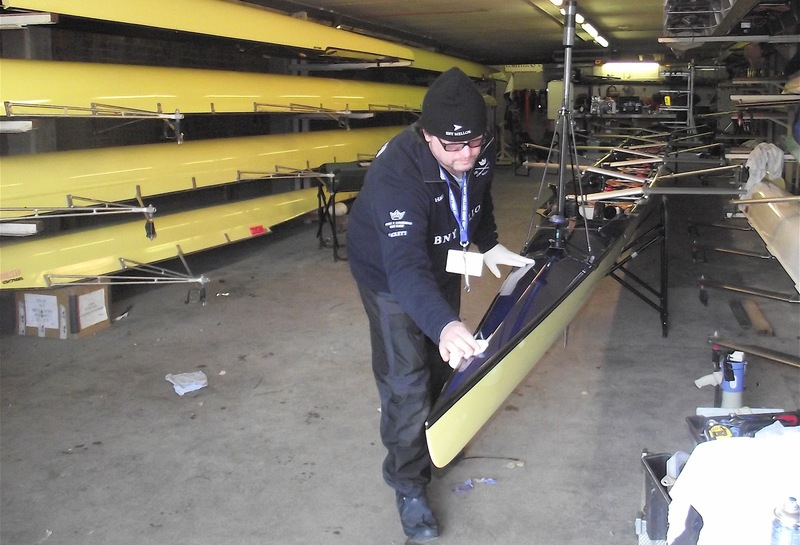 The morning of the Boat Race – polishing the Oxford Boat 2013. 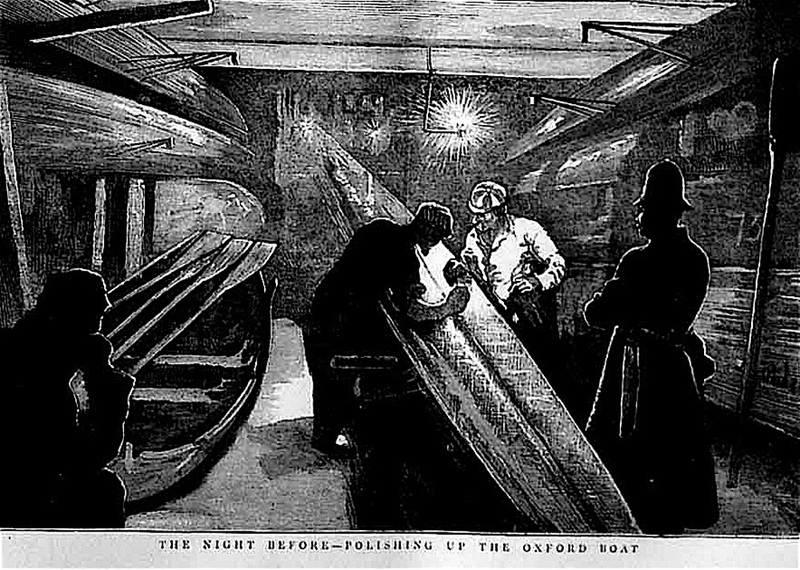 The night before the Boat Race – polishing the Oxford Boat 1874. 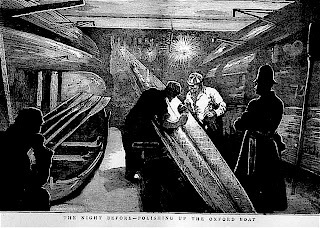 The bow of the Oxford Blue Boat. It is named after Acer Nethercott the Oxford and GB cox who died in January, aged 35. 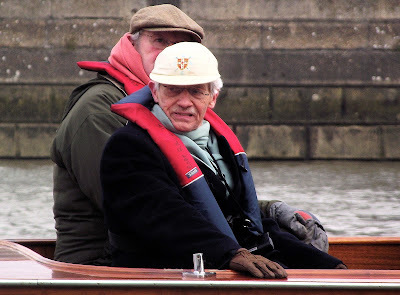 On the morning of the race I was on Putney Embankment and got talking to Chas Newens who has driven the Boat Race Umpire’s boat for many years. Now age 71 and from a family of Putney watermen, he says he was taught to steer the course by Ted Phelps, a member of the famous rowing and boat building family. 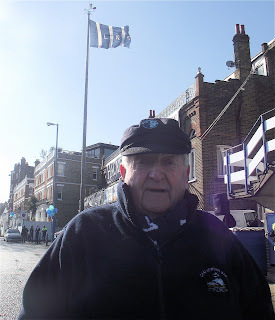 He also demonstrated the ‘Putney Whistle’ to me. This was used by the old watermen when they were afloat to gain the attention of someone on the shore. 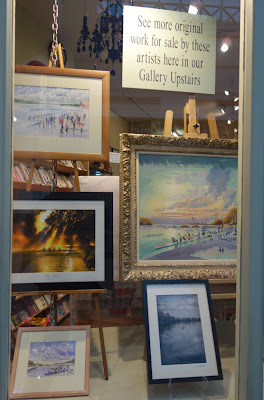 Cycling along the towpath from Putney to Mortlake, I passed Chiswick Steps. It struck me that this simple and uninteresting concrete construction would soon receive its annual but brief moment of fame when it would be mentioned as one of the timing points in the race. The record to here is 9 minutes and 58 seconds. 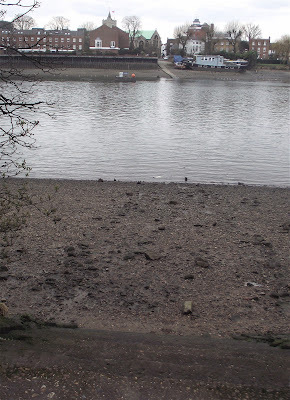 The steps are from the days when there were no nearby bridges over the river and watermen would row people across to Chiswick Church. Today, of course, the internet has replaced watertight containers. 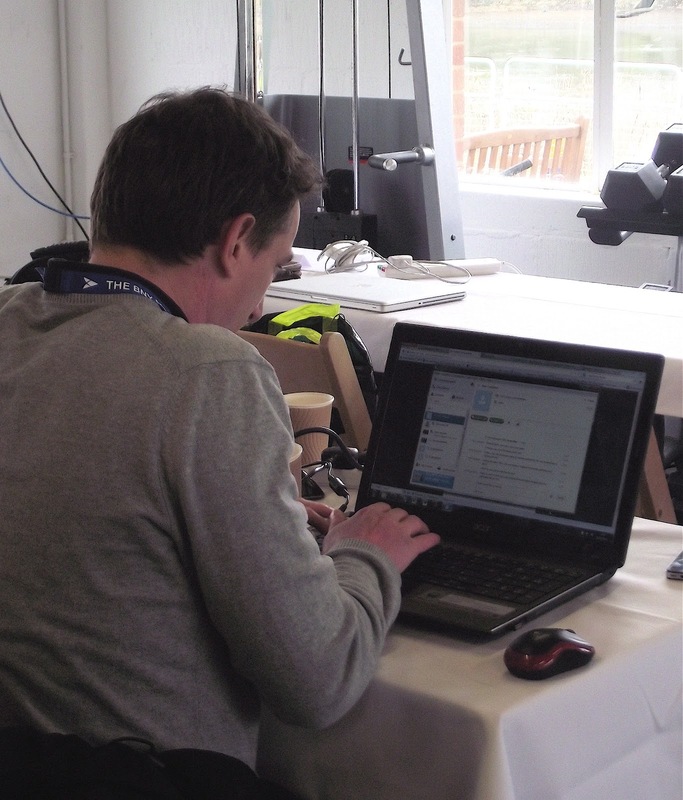 Martin Gough produces the live text from the Media Centre at the finish. 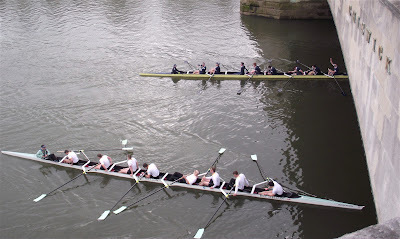 Standing on Chiswick Bridge, just in front of the finish line, I was able to get some nice pictures of the action. Here the Isis – Goldie Race is in its last few strokes. 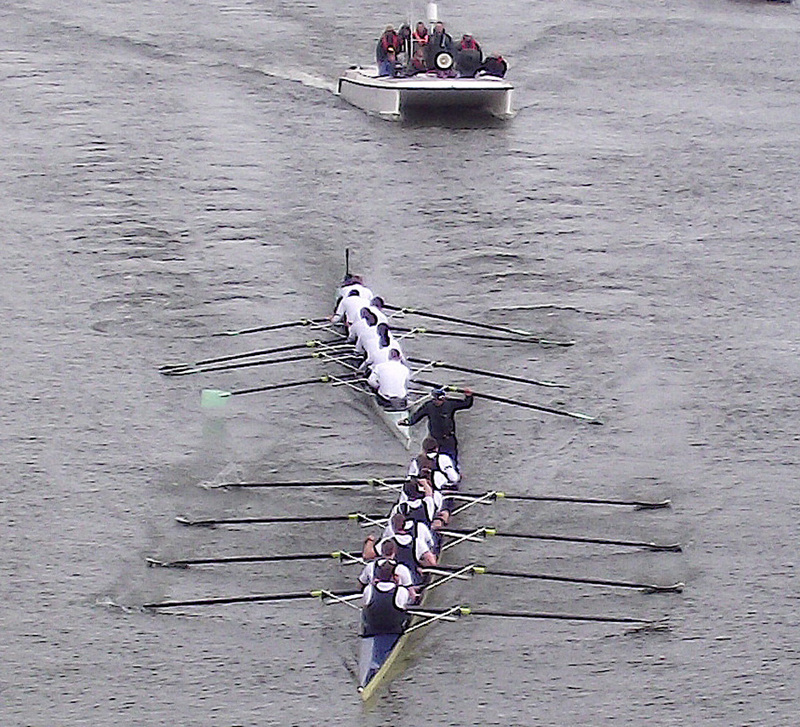 It was a very close and thrilling race which Isis (Oxford) won by 1/3 of a length. Here both crews drift exhausted under Chiswick Bridge. 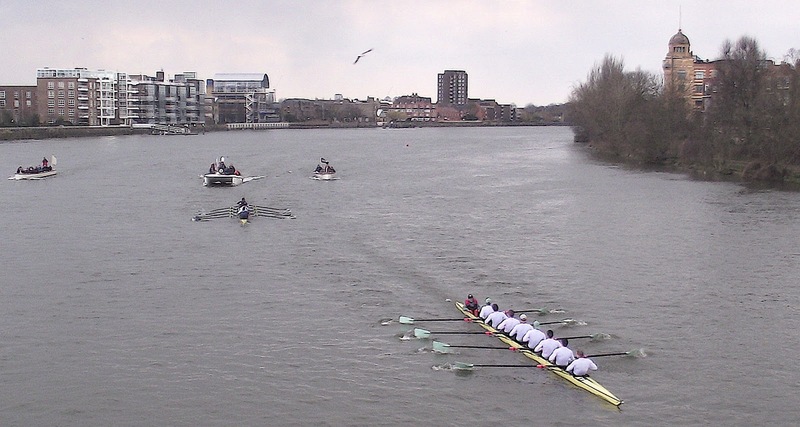 Oxford lead Cambridge in the final couple of minutes of the race. The last few strokes of the 159th Boat Race. Oxford cox Oskar Zorrilla stands in victory. Back on land, the losing crew find some comfort in comradeship. Champagne fills the air as Oxford receive their medals and the race trophy. A Cambridge man seems philosophical about the whole thing. The winning cox receives the traditional ducking from his apparently grateful crew. 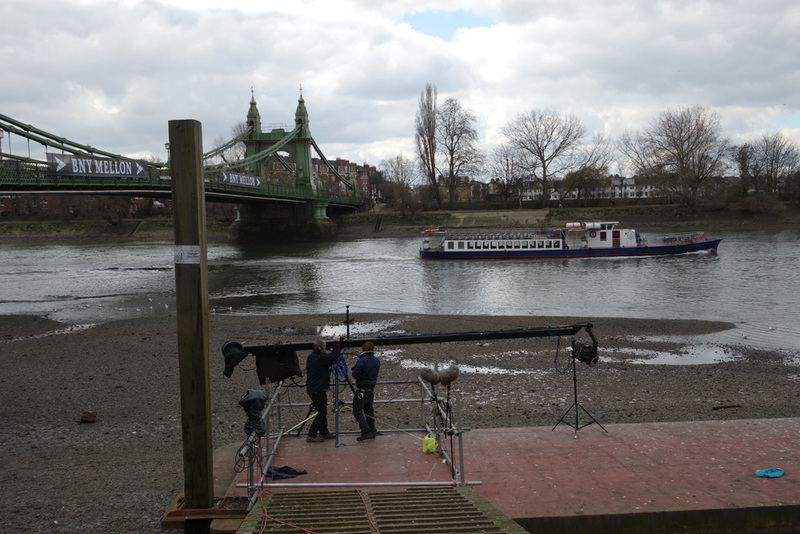 Media crews at Hammersmith are getting ready for the Boat Race. It’s Boat Race day. The riverbanks were calm this morning before the storm expected this afternoon – as every year, there are 250,000 people gathered to support either Oxford or Cambridge, showing either dark blue or light blue flags or bambams offered. 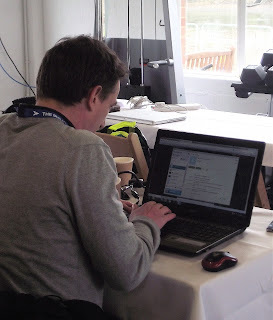 Ready is also HTBS’s reporter Tim Koch. 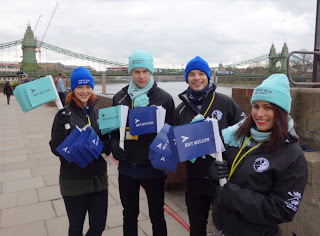 In Hammersmith, Chelsey, Joe, James and Rachel encourage passers-by to be prepared and take part in the cheering during the race. 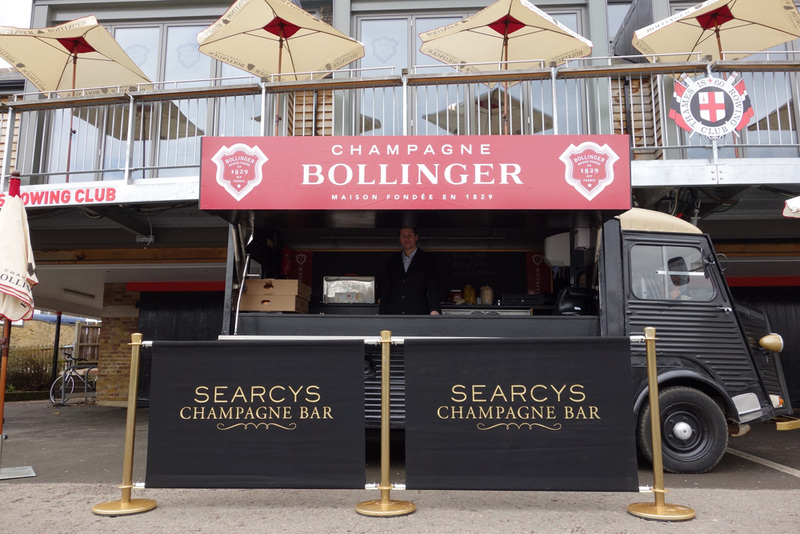 In Putney, the Bollinger Champagne van is ready to welcome thirsty spectators outside Thames Rowing Club…..
As soon as you reach Putney Bridge, you spot the banner: Which blue are you? 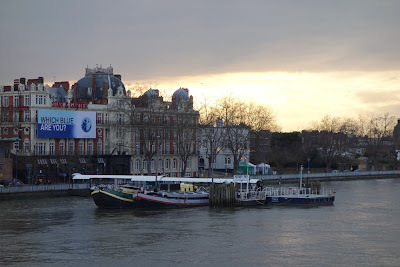 HTBS’s Hélène Rémond is also in London for The Boat Race. She walked around at Putney Bridge and Putney Embankment and took some photographs. She writes: ‘I took a few pictures that show how The Boat Race gets the attention of the passers-by in the streets, and how pubs and shops have taken the initiatives to make everyone enjoy this event’. 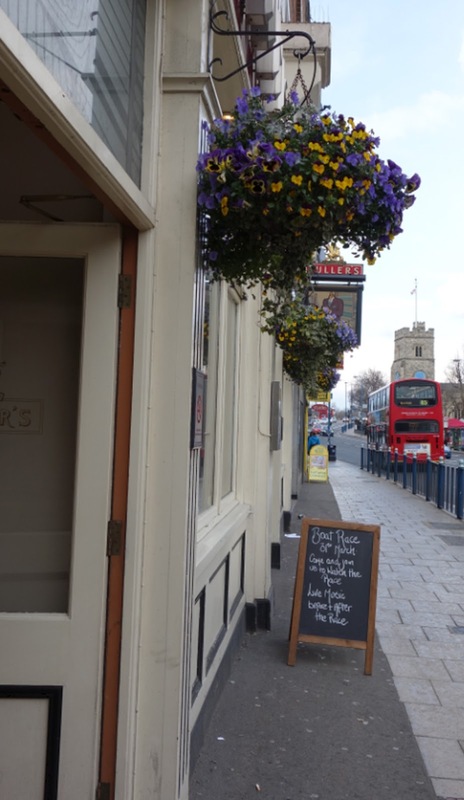 Pub in Putney for The Boat Race. 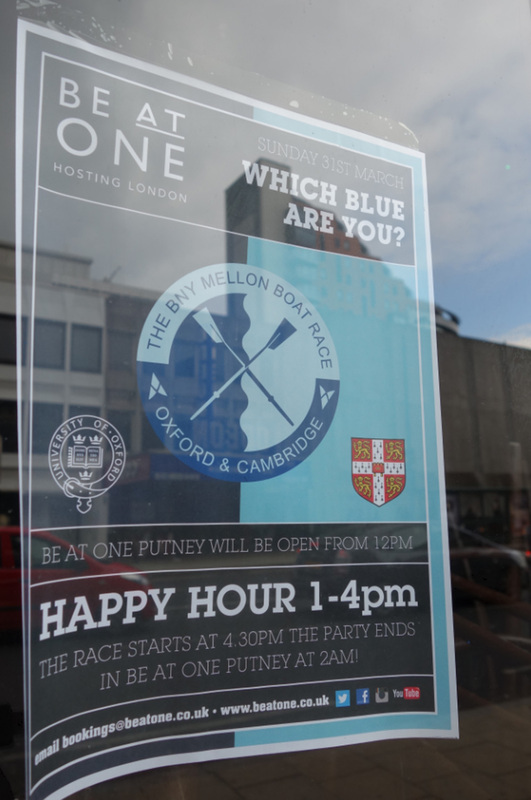 Happy Hour for the Boat Race. Many members of the media, like Martin Gough, had to face the cold weather on the launches out on the river. Late in the afternoon this Saturday, we witnessed a spring flood. 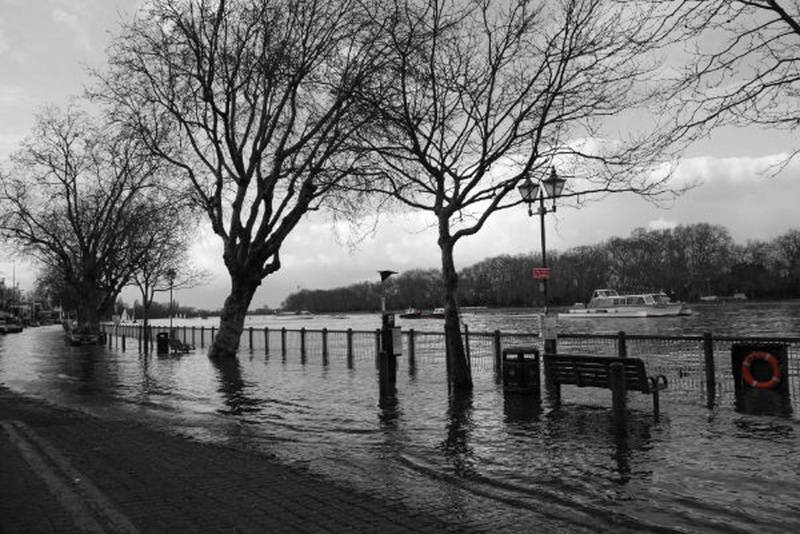 As Clare Balding from the BBC wrote on her Twitter account: ‘The river [was] full to bursting in Putney. 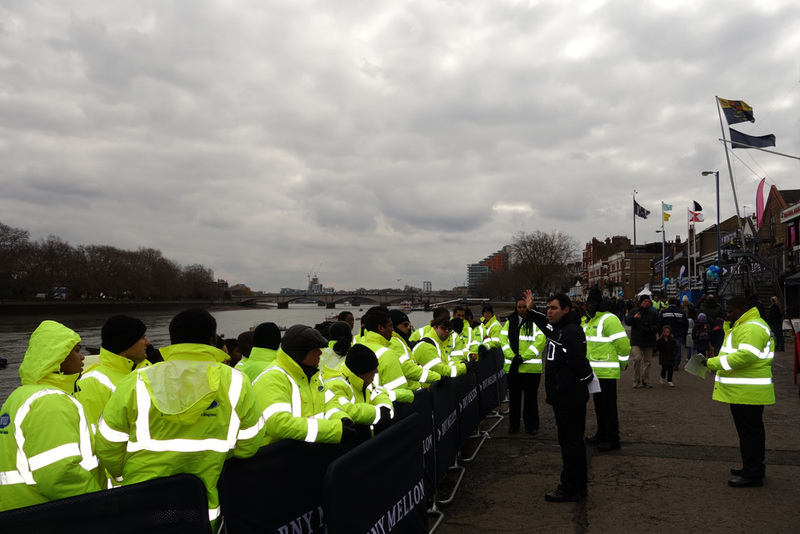 I’ve never seen it like this at #BoatRace time’. 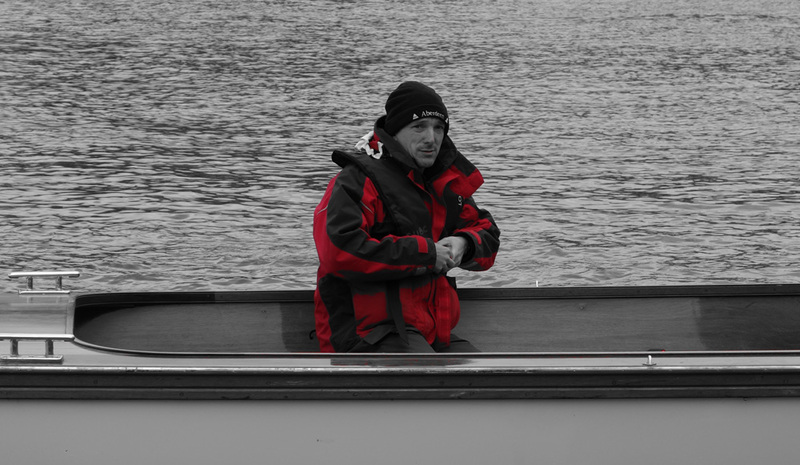 An unusual image of a rower: Rowan, Goldie’s stroke, preparing the handle of his oar. 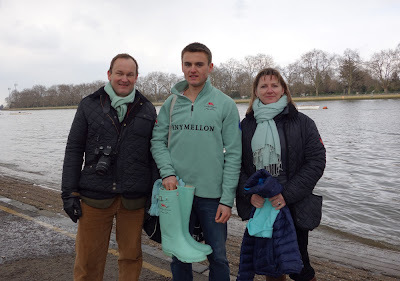 After the Oxford clean sweep at the Henley Boat Races last week, Light Blue pride was salvaged a little in the 18th Oxford - Cambridge Veterans’ Boat Race held on Saturday, 30 March. 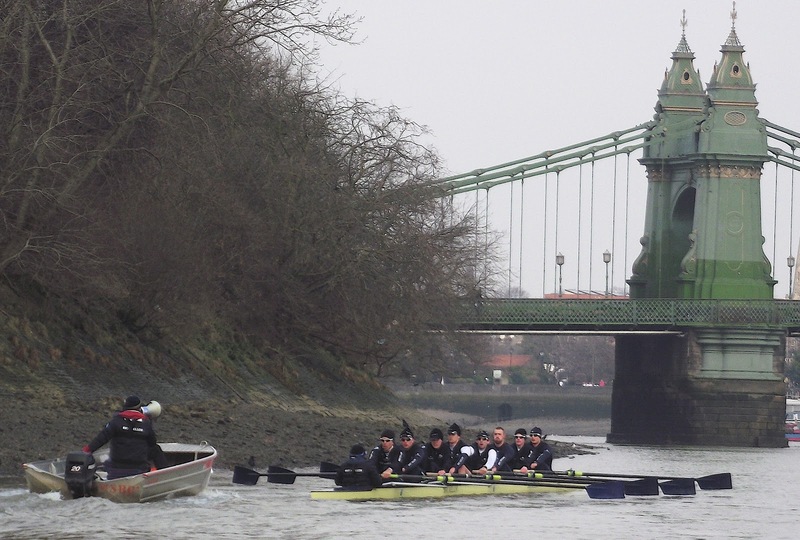 Cambridge won by four lengths on the ‘short’ course, Putney to Hammersmith. A full race report is here. The crew list was published a few days earlier but I spotted at least one change with Jonny Searle replacing Ben Kent in the Oxford boat. This event is the most informal of all the Oxford - Cambridge clashes with very little pre-race training and a lot of reliance on ‘residual fitness’. 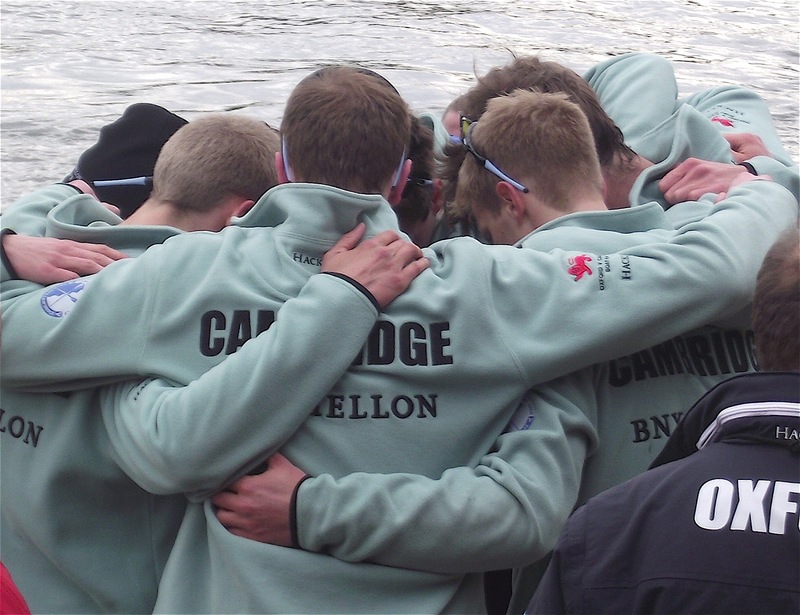 Perhaps Cambridge has taken the event a little more seriously than Oxford in recent years, something reflected in past results with the Tabs leading the series twelve wins to six. 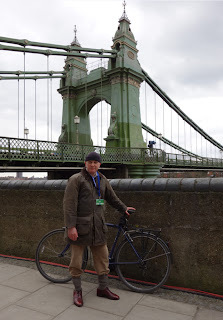 Cambridge has a clear lead over Oxford as the 18th Veterans’ (Masters’) Race approaches Hammersmith Bridge. The CUBC Press Conference. Steve Trapmore (Coach), George Nash (President and No. 5) and Henry Fieldman (Cox). Yesterday, the final pre-Boat Race press conference was held at the ‘Media Centre’ (otherwise known as Thames Rowing Club), two days before the big event. 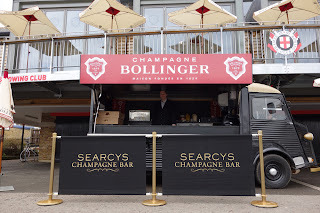 These are inherently unsatisfactory occasions as the chosen representatives of the two boat clubs are very unlikely to say anything but that they are well prepared and confident. If they have any doubts, they are not going to share them with the wider world – though this would make for a much more interesting event. Even when were given the chance to ‘trash talk’ their opponents (like boxers at a weigh-in) they decline the opportunity (when Sean Bowden was asked what he thought of the fact that Oxford were the favourites, he replied in words to the effect that he did not gamble). Fortunately, the Umpires, Matthew Pinsent and Boris Rankov, were slightly more informative. 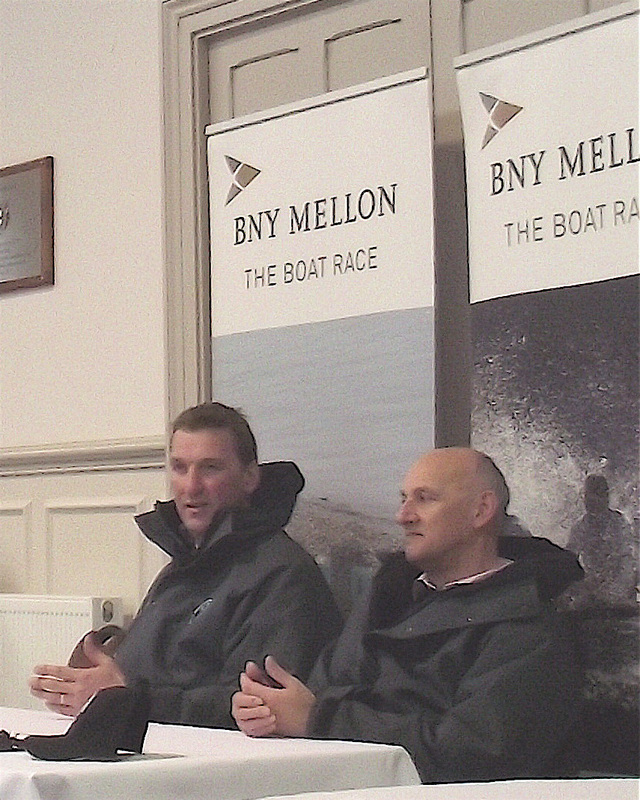 Sir Matthew Pinsent (Boat Race Umpire) and Professor Boris Rankov (Reserve Race Umpire). 1) To stop the race. 2) For the umpire and the crews to pass what the rules refer to as an ‘outside agency’ i.e. an obstruction in the water such as a person or an inanimate object such as a log. If the ‘outside agency’ was a person he or she would not be picked up by the umpire's boat (as happened last year). 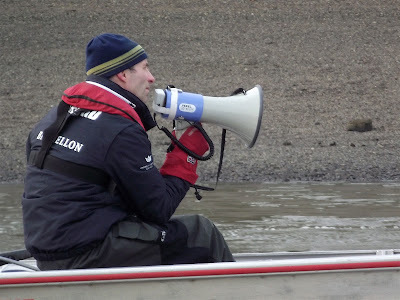 3) Once the obstruction was passed the race would be restarted as quickly as possible with both crews in the relative positions that they held when the race was halted (last year the crews were sent back to the point where the race had been stopped and had to wait a long time for the churned up water to subside). 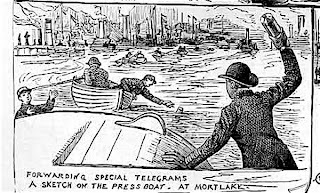 When the obstruction was passed it would no longer be the umpire’s concern and what the following flotilla did would depend on the prevailing circumstances. 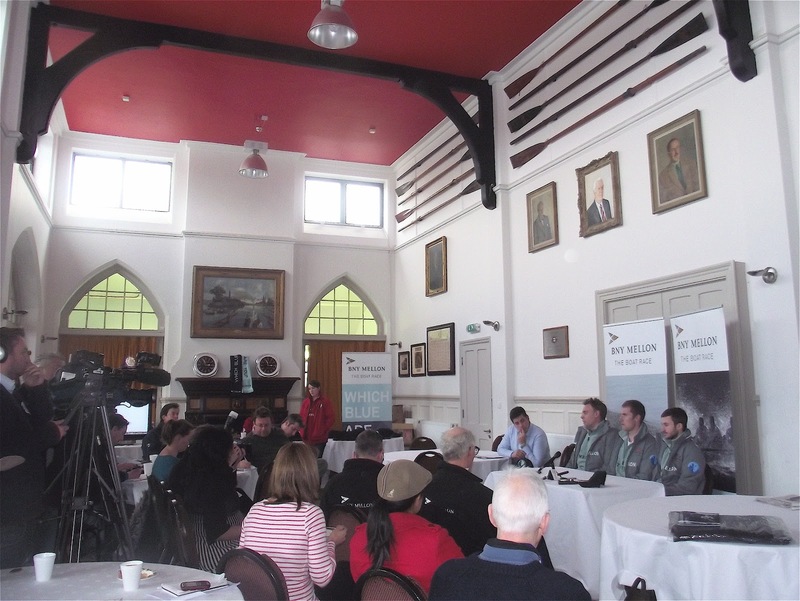 The OUBC Press Conference. Sean Bowden (Coach), Alex Davidson (President and No. 3) and Oskar Zorrilla (Cox). Matthew stressed that none of this was a criticism of the 2012 Umpire, John Garrett, who had to deal with an unprecedented situation. He also understood that the general public wants excitement but that he, as the umpire, wants a clean race. The Boat Race is, Matthew continued, a most complicated and unpredictable event. The ‘acid test’ is for him to be able to get out at the finish and be ‘pretty much ignored’ so he can ‘slip off to the bar’. Boris Rankov added that ‘the umpires are the only people involved who cannot win’. Responding to an attempt to draw him on the subject of security, Matthew said that he would not like it if the public were denied access to the river. He held that among the joys of the event are the facts that it is free, that the riverbanks are packed and that the pubs are full. I feel that this year the biggest defence against idiot swimmers may not be the fast boats of the Royal Marines stationed along the course, but will be the freezing temperatures. 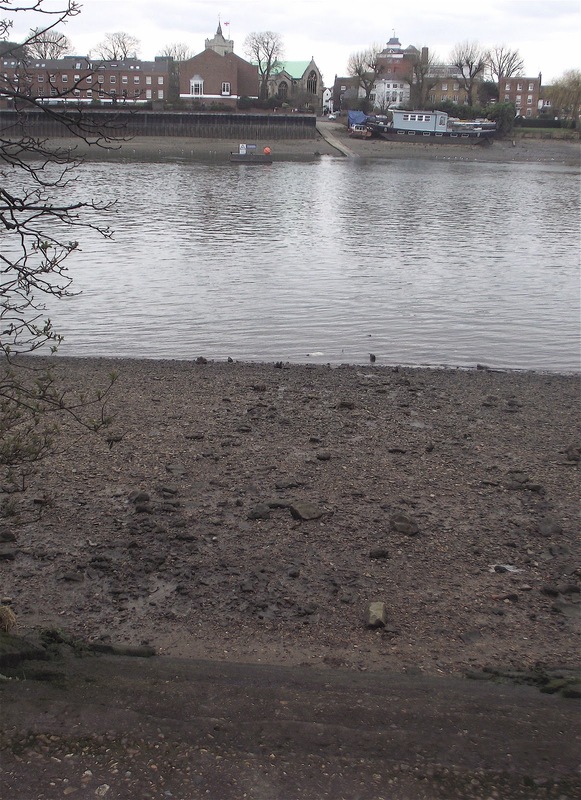 A bigger danger may be from debris swept into the river by recent high tides. Strangely, another problem may be an attack by angry otters. 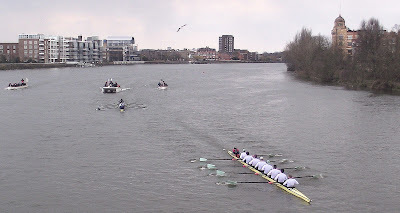 ‘Tideway Week’, as the name suggests, is the week before the Oxford - Cambridge Boat Race when the crews and coaches have moved to accommodation in or near Putney and undertake one or two outings a day on the river, often under the surveillance of the press in a following launch. They may also be shadowed by a random collection of their ‘Old Blues’. 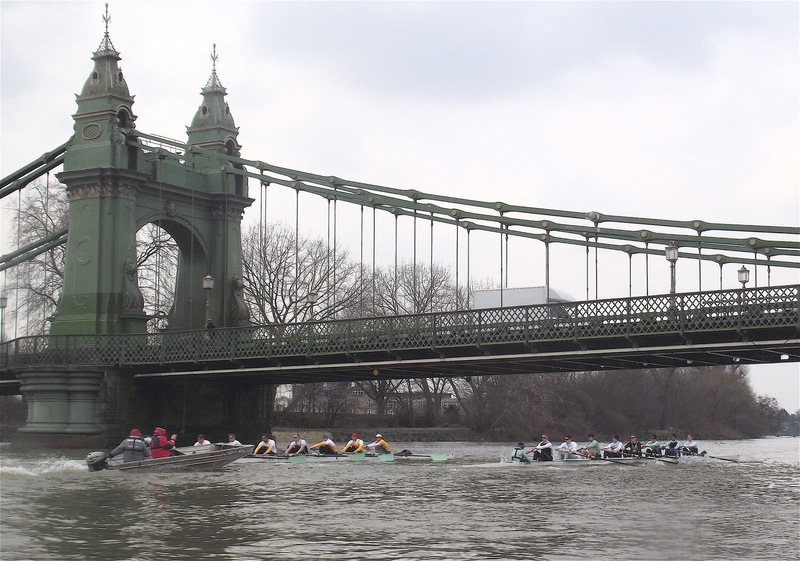 This year, Tideway Week runs from 26 to 31 March. 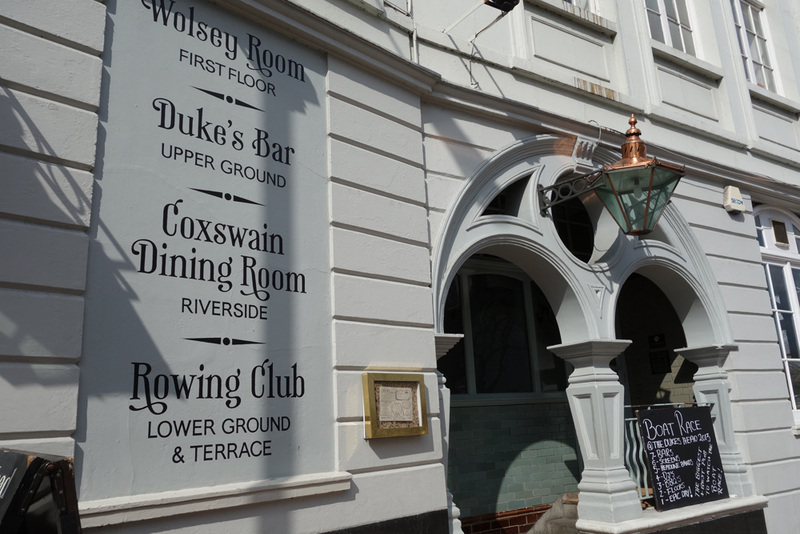 In the week before the race the hard work has been done and most outings consist of light paddling, practice starts and the occasional short piece at race pace against the reserve crew (Isis for Oxford and Goldie for Cambridge). On a very cold Wednesday 27 March, Oxford went out at 9am. 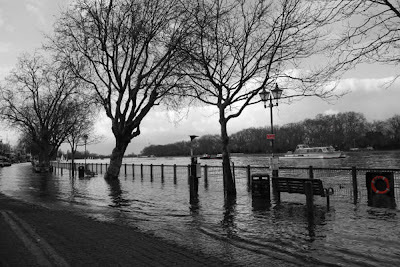 Oxford approach Putney Embankment. 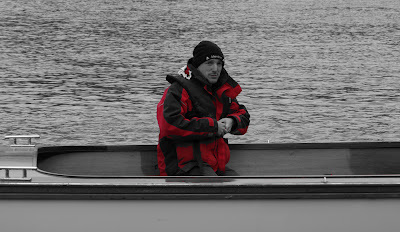 Stroke Malcolm Howard, the heaviest oarsman this year, won Gold in the 2008 Olympics and Silver in 2012, both in the Canadian Eight. 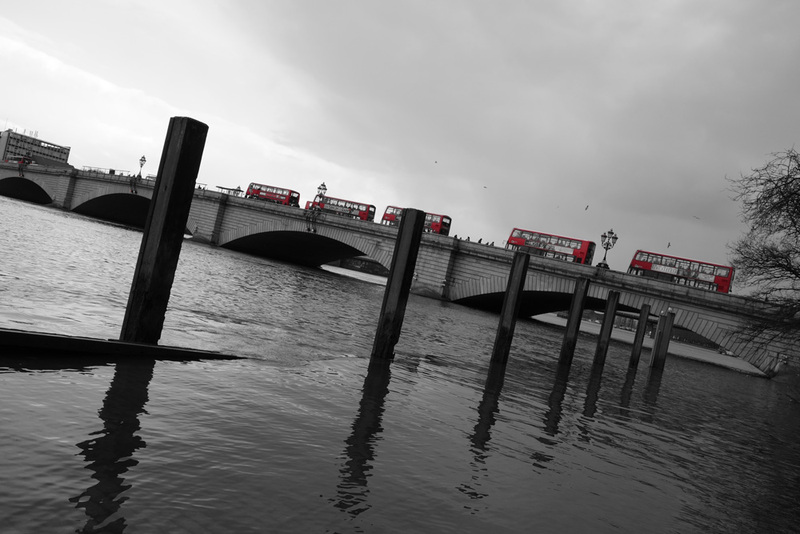 Oxford along Fulham Reach. From Bow: Patrick Close, Geordie Macleod, Alex Davidson, Sam O’Connor, Paul Bennett, Karl Hudspith, Constantine Louloudis, Malcolm Howard, Cox: Oskar Zorrilla. 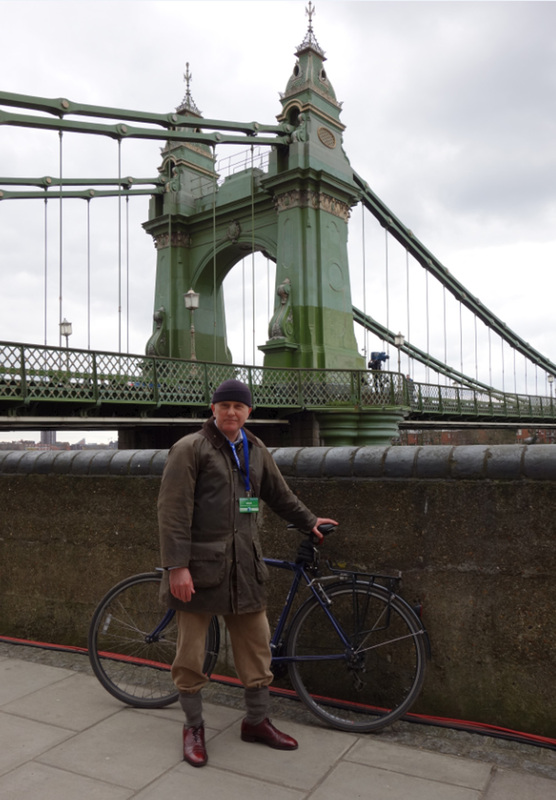 Oxford approach Hammersmith Bridge followed by coach Sean Bowden. 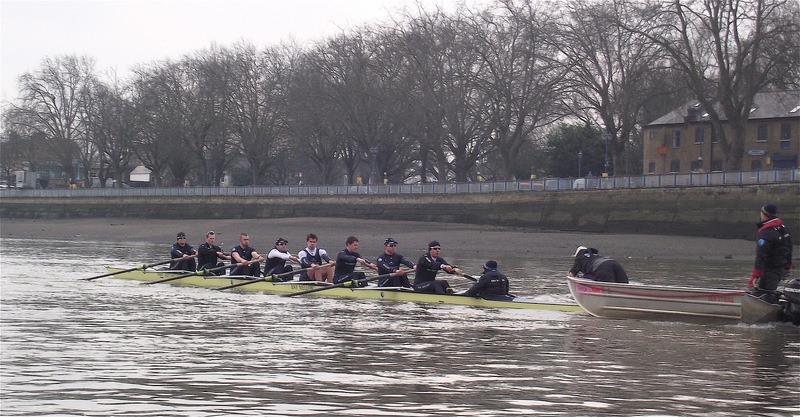 Oxford take the first stroke of a practice start alongside the Putney Embankment. 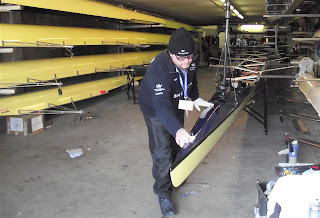 Oxford cox Oskar Zorrilla clips the Harrods Buoy with his starboard blades. Oxford coach Sean Bowden. He has coached ten Boat Race victories, two for Cambridge and eight for Oxford. Cambridge had a lie in and went out at 12pm. Cambridge passing St Paul’s School. From Bow: Grant Wilson, Milan Bruncvik, Alex Fleming, Ty Otto, George Nash, Steve Dudek, Alexander Scharp, Niles Garratt, Cox: Henry Fieldman. The Cambridge bow three: Wilson, Bruncvik and Fleming. 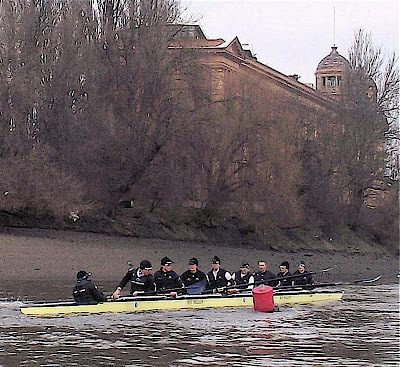 Bruncvik is the first Czech to compete in The Boat Race. 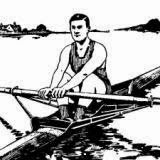 A double Olympian, at 82 kg, he has competed in all heavyweight rowing and sculling events at least at national level, apart from the single. 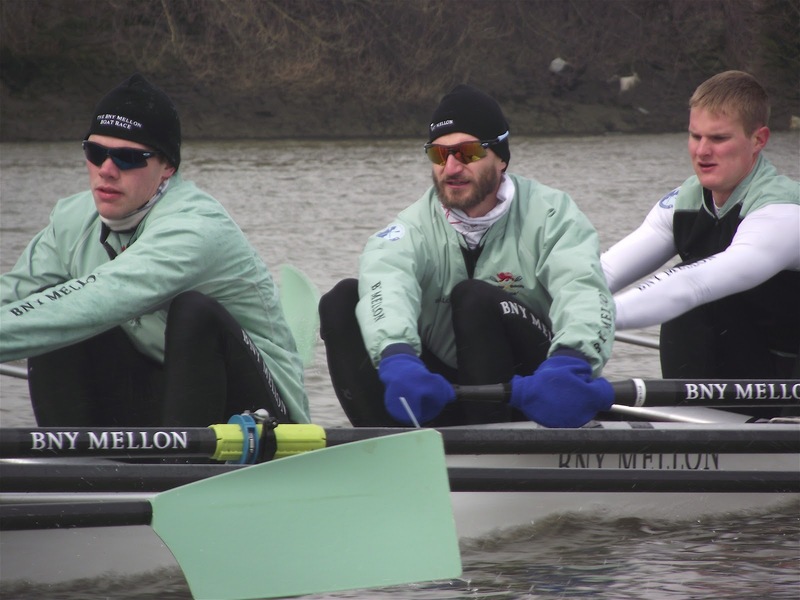 He may kill off the theory that ‘real men’ do not use the rowing mittens known as ‘pogies’. This ‘story’ has made it into a newspaper not noted for its rowing coverage. Cambridge pass the Mile Post (above six’s head). This is the monument to the great Cambridge, London and Thames coach Steve Fairbairn, situated one mile from the Boat Race start. 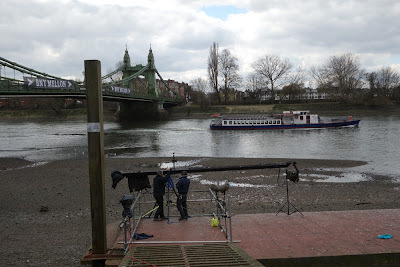 The scaffolding arrangement is for a TV camera on Boat Race Day. 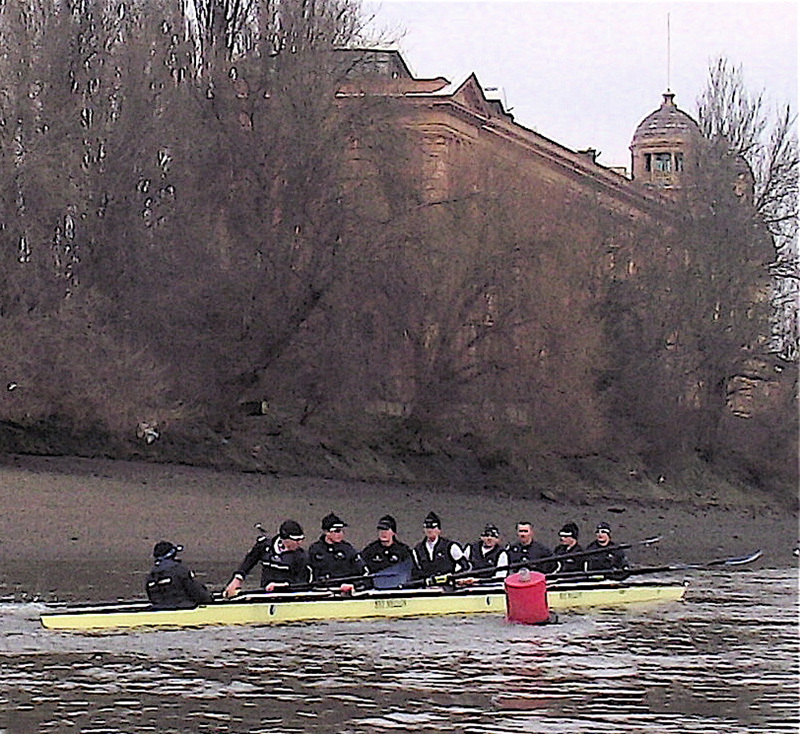 Cambridge raced Goldie, the reserve crew, from the Mile Post to St Paul’s. Here they are passing the old Harrods Depository. Goldie kept an overlap with the Blue Boat all the way. Draw your own conclusions on the significance of this. The Cambridge - Goldie race goes under Hammersmith Bridge. 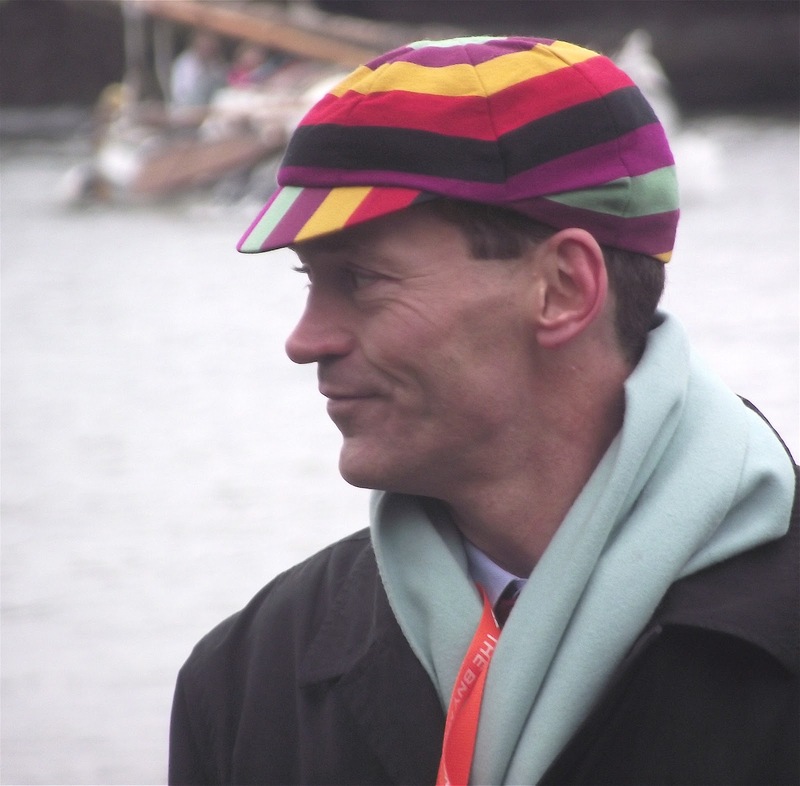 Blue Boat cox Fieldman was constantly warned by coach Steve Trapmore who undertook the role of ‘umpire’. Will he steer so aggressively on the big day? Old (Light) Blues cast a knowing eye over the youngsters. 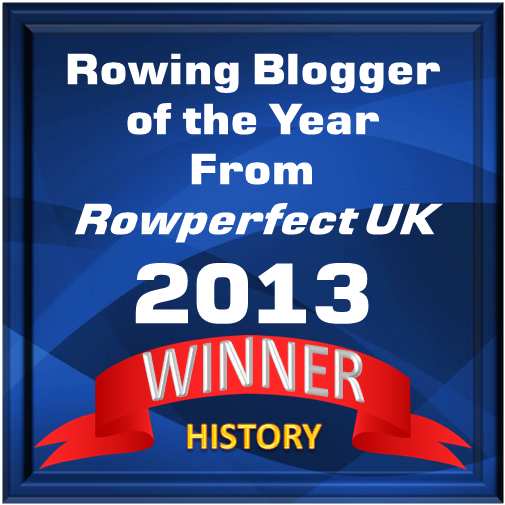 Most old rowers subscribe to the idea that ‘the older we get, the better we were’. Charlie Pitcher Sets an Amazing Record! How Old is Sons of the Thames RC? 1867 Paris Exhibition Regatta Medal for Sale! 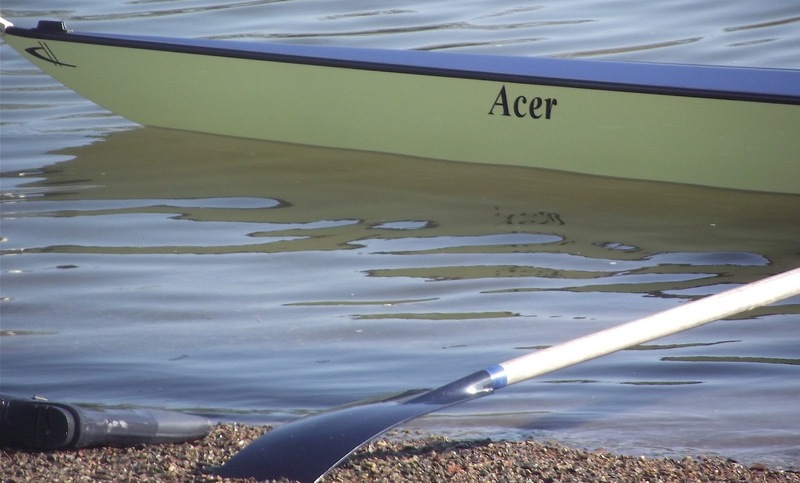 World Rowing Video Library Now Open for the U.S.